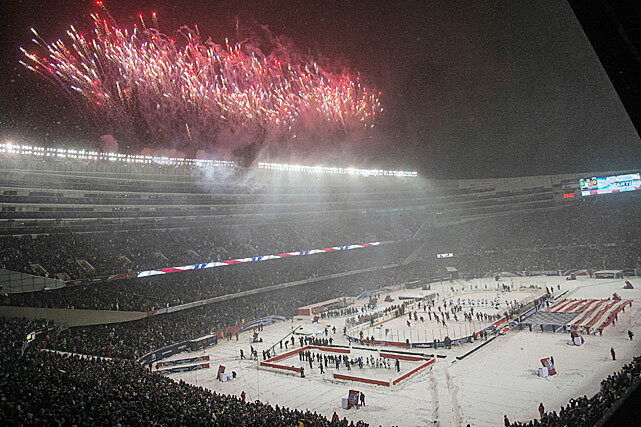 The 2015 NHL Winter Classic's low TV rating revealed a cold reality about the event. 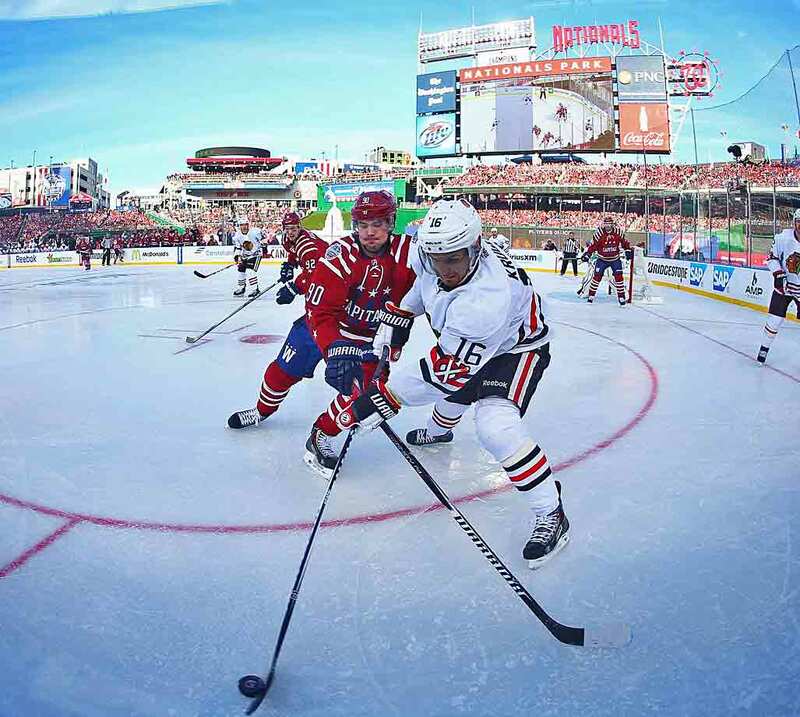 The bad news came a day after the Capitals and the Blackhawks delivered what may have been the most entertaining Winter Classic to date. NBC is reporting a 2.3 overnight rating for the New Year’s Day game from Nationals Park in Washington, D.C., the lowest overnight number for any of the seven Winter Classics. There already have been some pretty comical attempts to spin the news, including this gem from NBC Sports PR that swooned over the fact that the ratings were up 77% over the regular season game average from 2013–14. But no one’s going to buy that silliness. Nor was anyone caught by surprise. No matter how dramatic the ending, Thursday’s game had plenty stacked against it from a television perspective, starting with competition from a raft of highly anticipated college football bowl games. 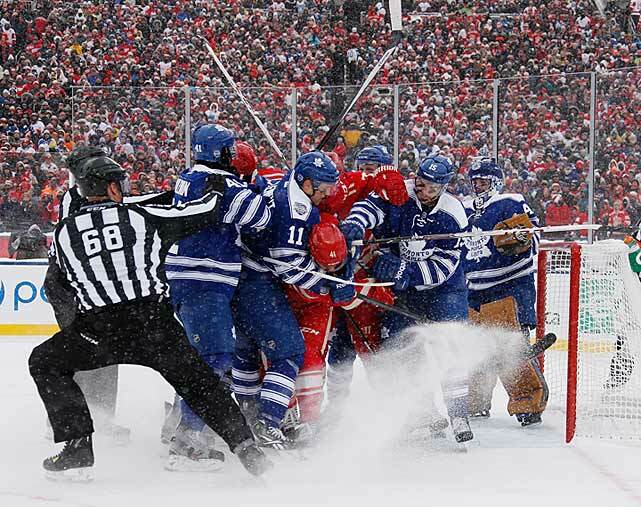 Add in the fact that this year’s Winter Classic served as the showcase for a low-wattage rivalry and it actually is a wonder the ratings were as high as 2.3. 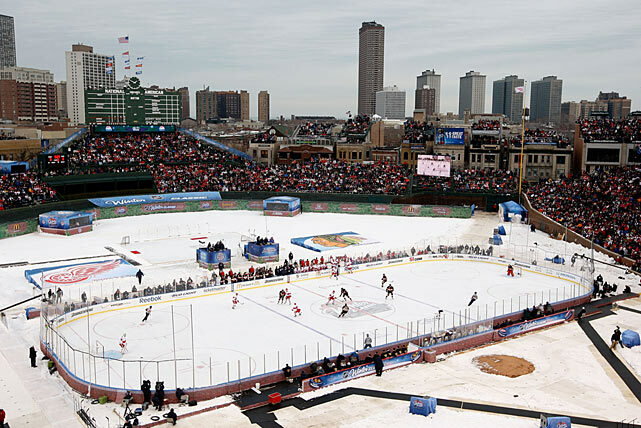 Sure, Chicago is a marquee franchise, exactly the sort of team that should guarantee eyeballs, but there’s a fatigue factor to consider—the Blackhawks have made three outdoor appearances in the last five years, including last winter’s Stadium Series game at Soldier Field. Washington? The Caps may have Alex Ovechkin, but he's a draw in the manner of an aging Tom Cruise. Ovi is famous enough, but he's nowhere near as compelling a draw as he was years ago (and despite the best efforts of GEICO, Nicklas Backstrom will never be a draw of any kind). And with no history or storyline drawing these clubs together, the matchup made as much sense as a fish on a bicycle. And then there was the setting. 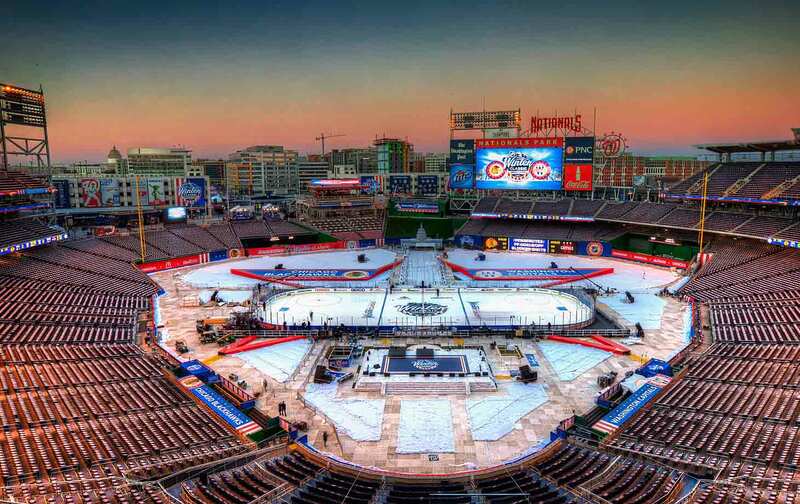 While the league did a spectacular job with the layout, Nationals Park is ultimately just another cookie-cutter baseball stadium, lacking the visual or historical hooks that might get viewers to drop the remote the way they did for hockey in the Big House or at Wrigley Field or Fenway Park. 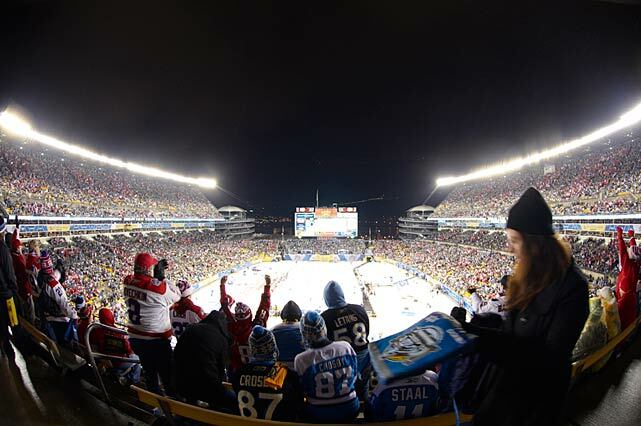 Since the NHL staged its first Winter Classic on Jan. 1, 2008 outdoor games have proved to be extremely popular with fans as well as players. 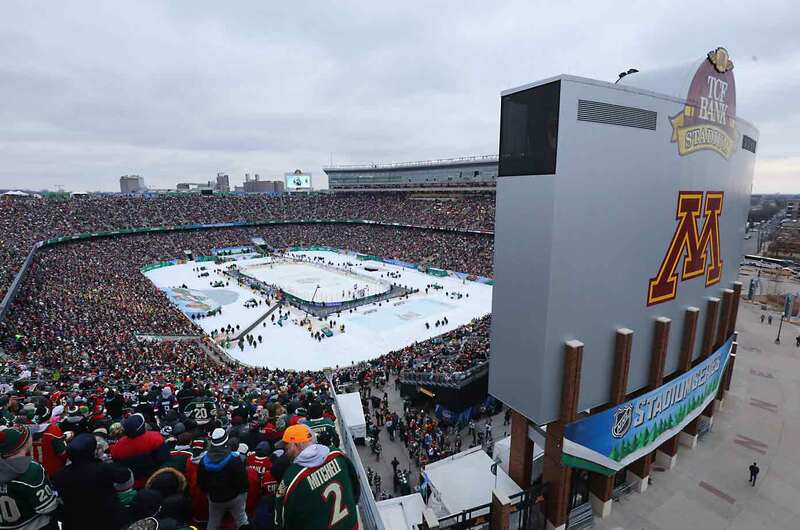 Minnesota got its first on Feb. 21, 2016, a tilt against the Central Division rival Chicago Blackhawks at TCF Bank Stadium on the campus of the University of Minnesota. 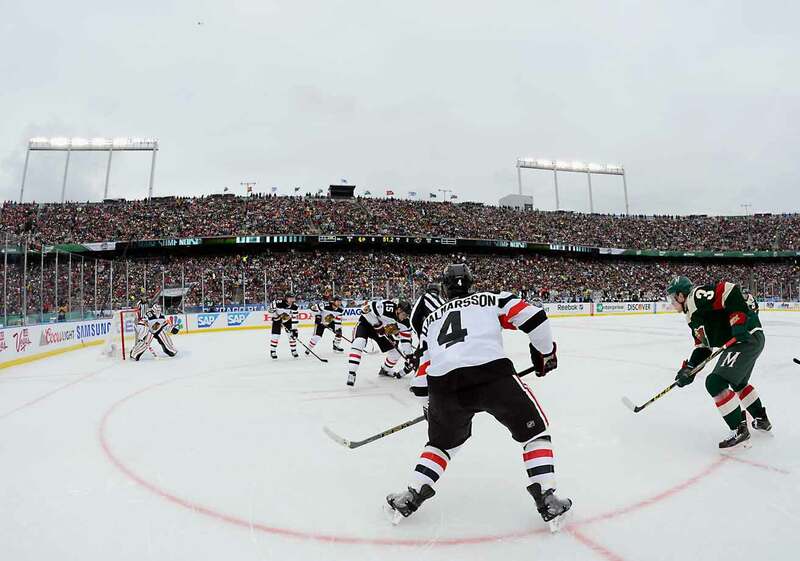 A boisterous crowd of 50,246 enjoyed relatively comfortable 36-degree weather and a romp by the hometown Wild. Center Jason Pominville and his linemates Nino Niederreiter and Erik Haula had a big day, combining for three goals and eight points in Minnesota’s 6–1 rout. With a goal and two assists apiece, Pominville and Haula tied the NHL outdoor game scoring record held by seven other players. A tough day for Niklas Hjalmarsson and the rest of the defending Stanley Cup champion Blackhawks, who were held at bay by Wild goalie Devan Dubnyk (31 saves), who lost his shutout on a goal by Patrick Kane with 7:55 to go in the third period. In 2016, the traditional New Year's Day event returned to Boston. 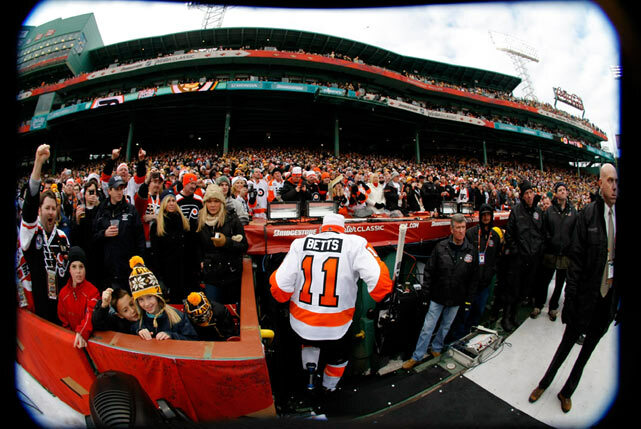 Fenway Park hosted the Bruins and visiting Philadelphia Flyers in 2010. This time, the site was the more modern Gillette Stadium, home of the NFL's Patriots. The Bruins' foes were their traditional bitter rivals, the Montreal Canadiens. 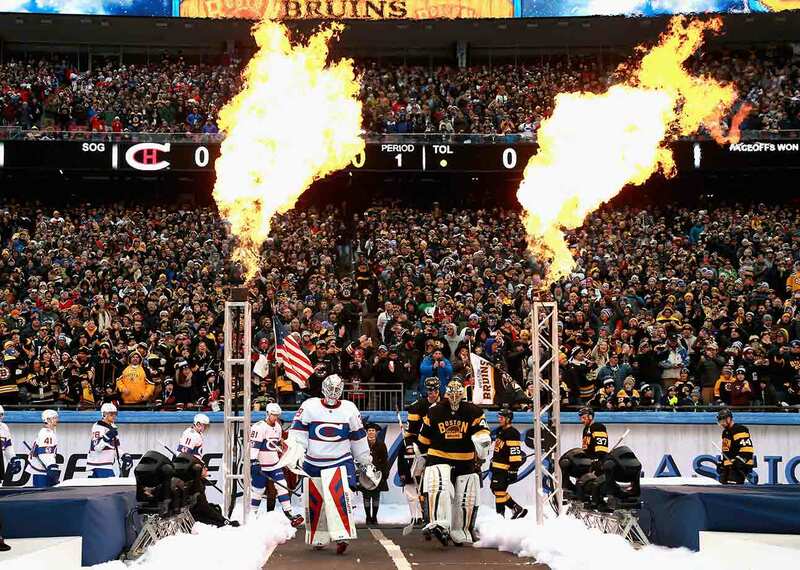 There was a surprising warm, communal spirit to the day as nearly 70,000 Bruins and Canadiens fans gathered at Gillette Stadium, tailgating and partying from the early morning until the 1:30 p.m puck drop. The weather was reasonably mild (about 40 degrees) and the ice condition was excellent and fast. Canadiens goalie Mike Condon (left) was the big story of the day. A Massachusetts native, he had the unenviable task of replacing the injured Carey Price while the Habs tried to crack his counterpart, Tuukka Rask in Boston's net. Both teams wore special throwback jerseys for the game. The return of the injured Brendan Gallagher sparked Montreal's offense to an easy 5–1 win. 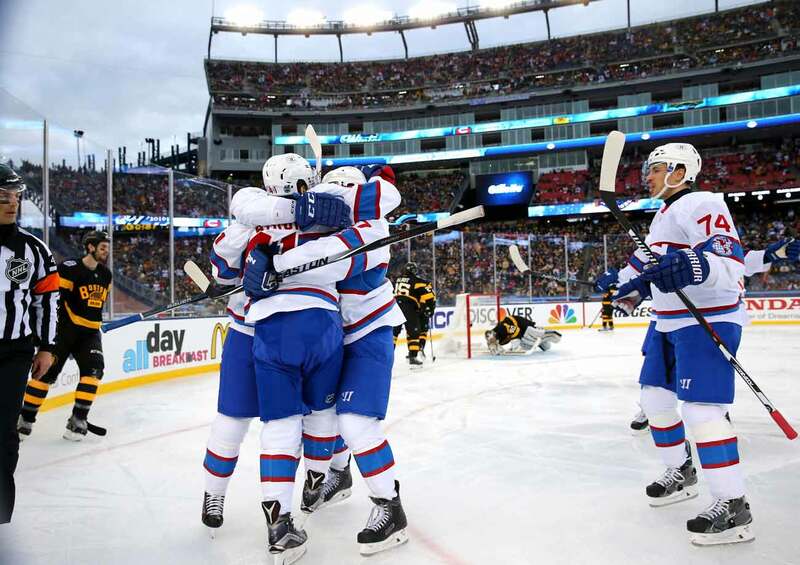 Constant pressure on the Bruins and a goal off a batted puck enabled the Habs to open a 3-0 lead by the end of the second period. Boston drew within 3-1 on a Matt Beleskey tally at 3:36 of the third, but the game was never in doubt. 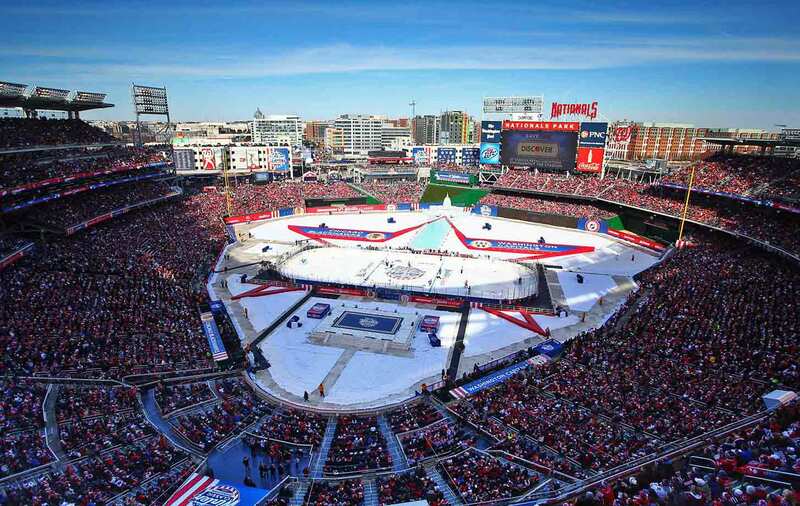 The 2015 edition was awarded to Nationals Park in Washington D.C. with the Capitals hosting the Chicago Blackhawks. A crowd of 42,832 fans filled the park on a brilliant winter afternoon with a game time temperature of an almost balmy 44 degrees. Ice conditions were very good. 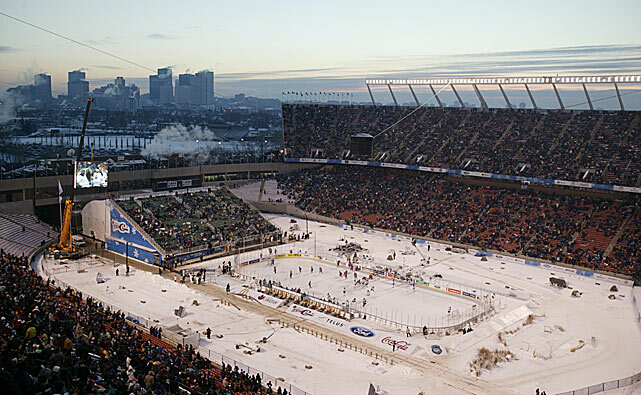 Despite concerns about dangerous sun glare, the game started on time, though the teams switched ends at the 10-minute mark of the first period. After the Blackhawks tied the score at 2-2 in the second period, the game settled into a defensive battle. Winger Troy Brouwer would prove to be the man of the hour. Capitals captain Alex Ovechkin put Washington up 2-0 midway through the first period, but Chicago goalie Corey Crawford settled down and proved tough to beat after that. With 12.9 seconds left in regulation, Troy Brouwer delivered the game-winning goal for the Capitals. The ending was even more special as Brouwer's father, who had been recovering from a stroke, attended the game—the first time he had seen his son play in Washington. 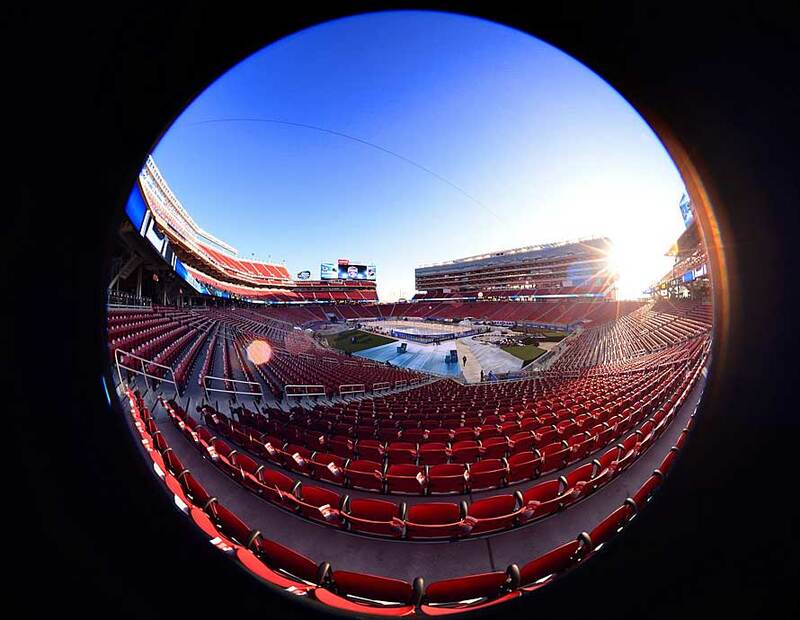 Levi's Stadium, home of the San Francisco 49ers, in Santa Clara hosted Northern California's first outdoor game, a clash between the local favorite San Jose Sharks and the Los Angeles Kings on Feb. 21, 2015. 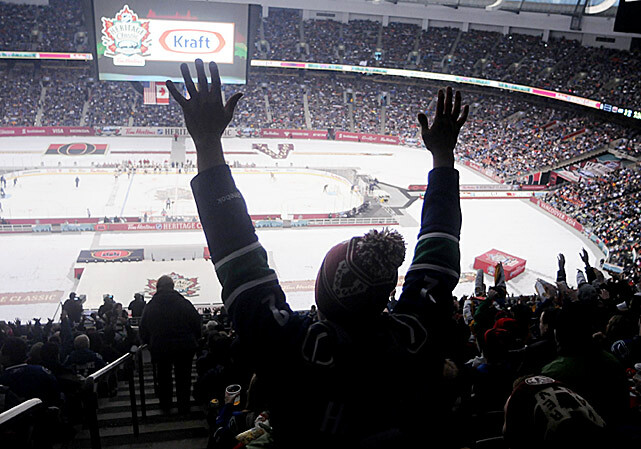 Musical entertainment has been a staple at outdoor games. 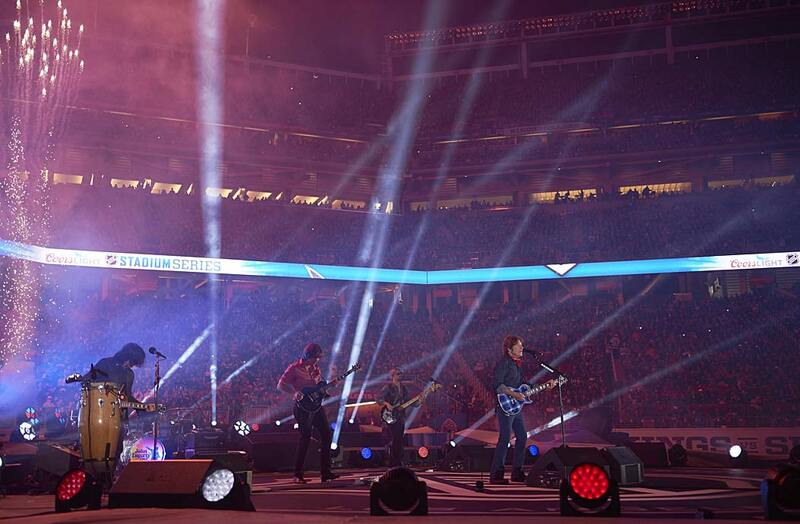 The Kings-Sharks tilt at Levi's Stadium featured former Creedence Clearwater Revival front man John Fogerty (seen here) as well as Melissa Etheridge. The Kings prevailed, 2-1, on goals by Kyle Clifford and Marian Gaborik, who potted the game-winner at the 4:04 mark of the third period. 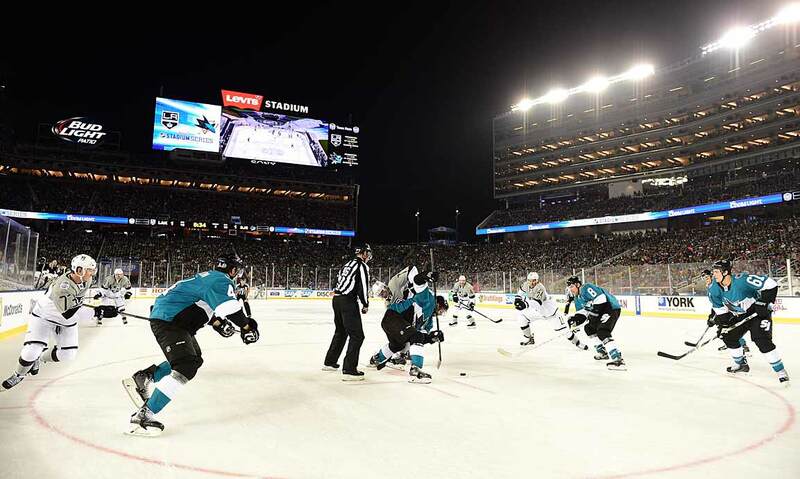 In 2014, the league pulled out all the stops and scheduled six of outdoor games. 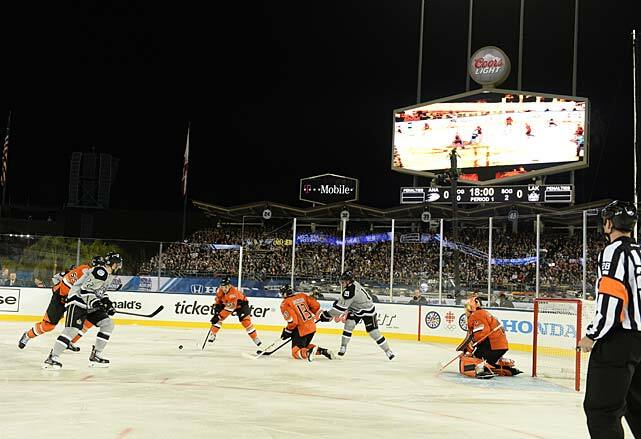 Four were part of a Stadium Series with one at Soldier Field in Chicago, one at Dodger Stadium in Los Angeles, and two at New York's fabled Yankee Stadium. 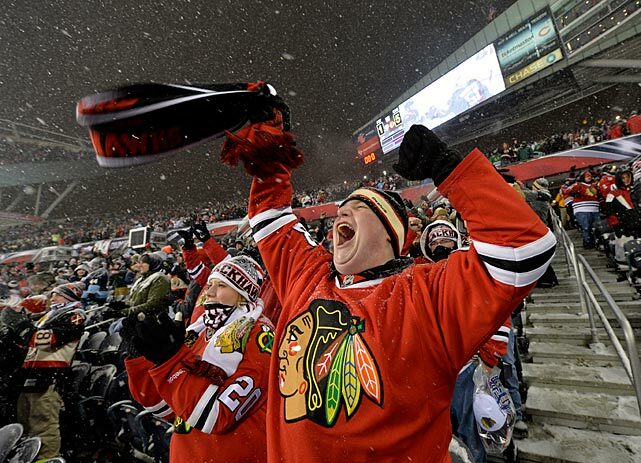 The game at Soldier Field on March 1 drew a sellout crowd of 62,921 for the hometown Blackhawks' battle with the Pittsburgh Penguins. 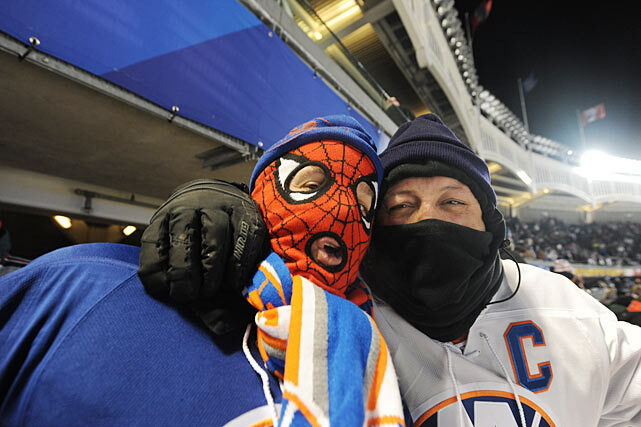 The fans didn't seem to mind the heavy snow, swirling wind, and 17-degree cold. Snow accumulated quickly on the ice, turning the Chicago game into a glorified game of pond shinny. But there were no complaints, at least not from Blackhawks coach Joel Quenneville. "Probably the greatest setting you could want," he later said. "With how hard it was snowing it was like, 'Wow, these are amazing conditions. I think everybody went back to when they were kids." Added Hawks forward Patrick Sharp. "The ice was very good, but that first period it was tough to see and handle the puck. It really felt like a real outdoor game. There were no real systems or structure. We were just kind of hoisting the puck, slapping it around and having fun." 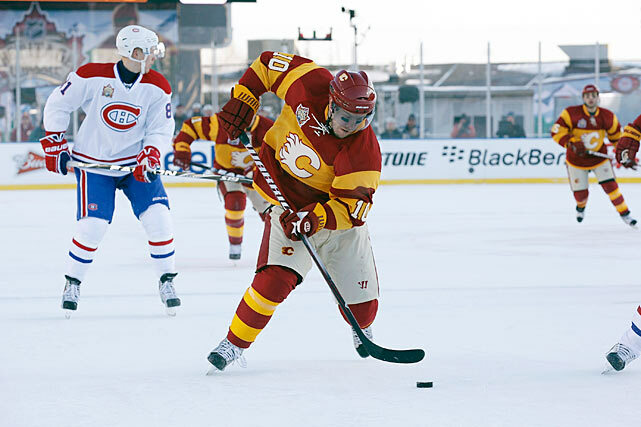 For Sidney Crosby (right), his third outdoor appearance wasn't quite as magical as his first (Buffalo, 2008). Playing his first game in Chicago since his rookie season (2005-06), the Penguins' captain was held to a mere three shots by the Blackhawks' defense. Blackhawks captain Jonathan Toews was the scoring star for Chicago, beating Penguins goalie Marc-Andre Fleury for two goals and tacking on an assist in his team's 5-1 win that dropped Pittsburgh's all-time mark to 1-2 outdoors. The Blackhawks are evened theirs to 1-1. 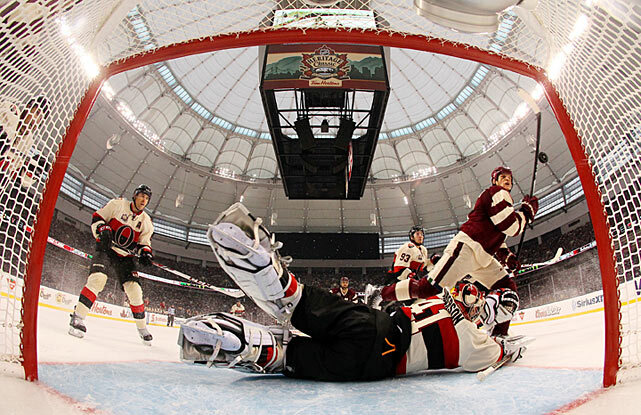 The NHL's third edition of the Heritage Classic, the game that first took the league outdoors in 2003, was held at Vancouver's retractable roofed B.C. Place on March 2. Unfortunately, the weather did not conspire to create a winter wonderland setting. 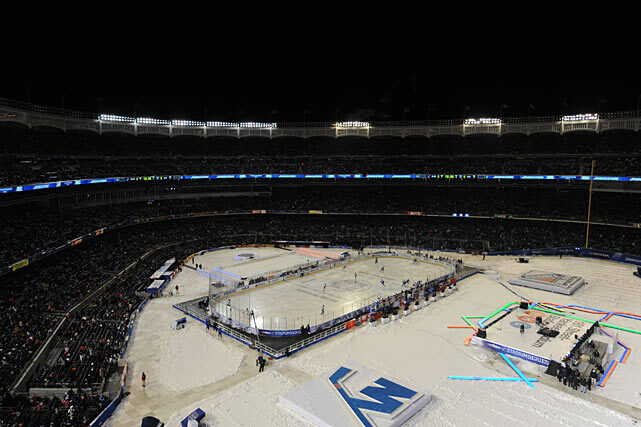 Rain required a closing of the roof, turning the year's final outdoor game into an indoor match. 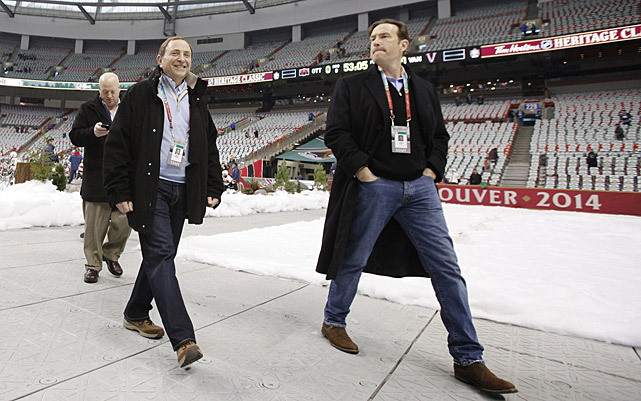 Commissioner Gary Bettman (center) and league COO John Collins may have pressed the league's luck by scheduling so many outdoor games in one year. 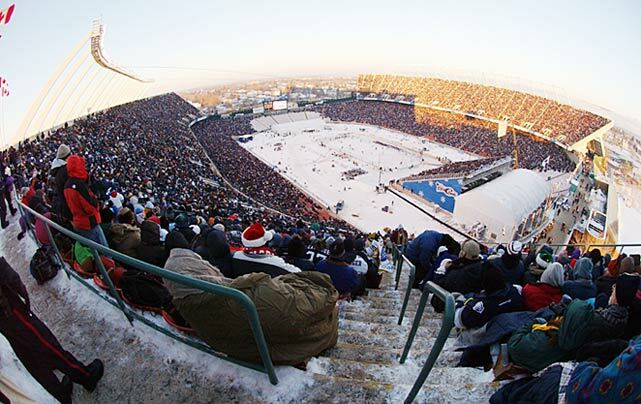 Tickets were still available the day of the Heritage Classic and fake snow was used to create the proper atmopshere. There were also some complaints about the ice. "I was glad (organizers) had the option to close [the roof|, because it probably would have ruined the game if it was raining out," Ottawa captain Jason Spezza said. "The ice got bad as it was with it closed." 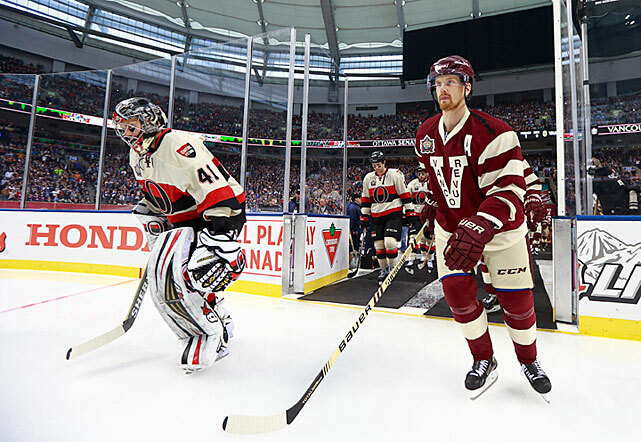 The game between the Ottawa Senators and hometown Canucks was billed as a celebration of some ancient hockey history: the 1915 Stanley Cup championship series between the original Senators and Vancouver's Millionaires. For this occasion, the teams wore throwback uniforms from that time period. After allowing two early goals, Senators goalie Craig Anderson (29 saves) and Ottawa's defense stifled the Canucks the rest of the way. Rookie Cody Ceci eventually put the Sens ahead for good as they rallied for a 4-2 win. Despite the weather setback, the 54,194 fans on hand enjoyed themselves. Well, given the final score, Senators fans likely had a better time than the hometown faithful, but conditions were certainly more comfortable than they'd been at most of the year's outdoor games. "It was a pretty cool setting, just to have that many people watch the game, and it was loud all game long," said Sens defenseman Cody Ceci. "We were in Vancouver, but there was a lot of Ottawa fans, so it's good to see fans come out all that way." 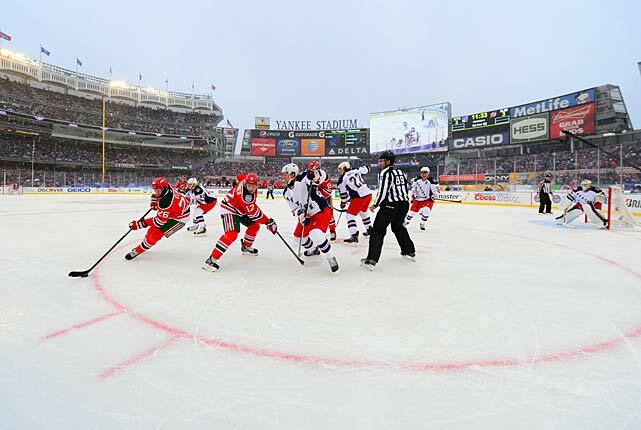 The first game at Yankee Stadium on Jan. 26 had featured an installment of the Hudson River rivalry between the Rangers and New Jersey Devils in daylight. Three frosty nights later, the Islanders arrived to battle the Broadway Blueshirts. 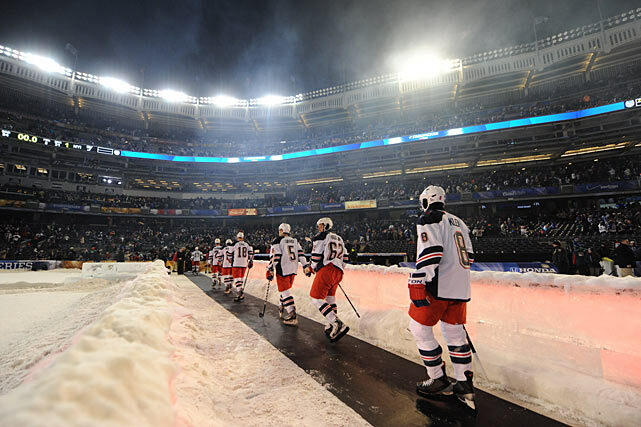 With the Big Apple trapped in a week-long Arctic vortex, fans were forced to bundle up against temperatures that started at 22 degrees for the opening puck drop and steadily descended toward zero as the wind chill played its part. Both teams' offenses were cold as the puck danced unpredictably across hard ice pockmarked with holes and cracks, but the Rangers managed to score twice and that was enough to edge their rivals, 2-1. 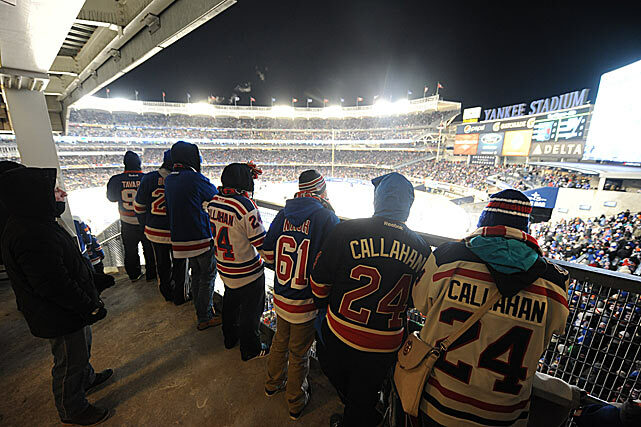 Though the Rangers were officially the visiting team, most of the sell-out crowd of 50,027 was firmly in their corner. 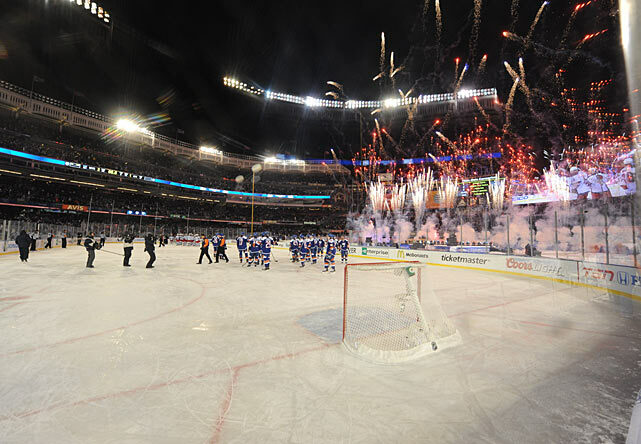 Now customary at the NHL's outdoor events, a touch of spectacle was provided by postgame fireworks and an earlier musical performance by Cee Lo Green. 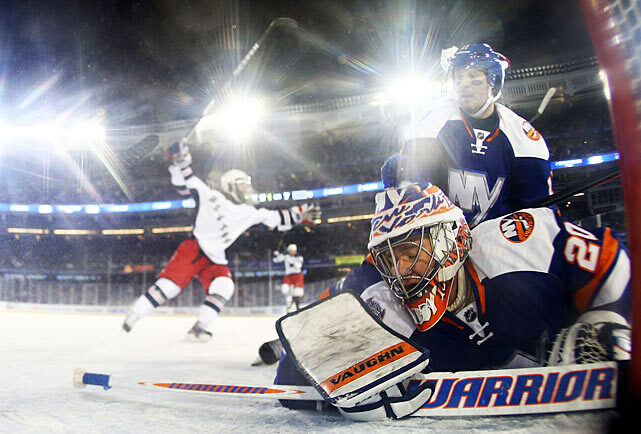 Having secured a precious two points, the Rangers headed home to the warmth of Madison Square Garden, where they hosted a rematch against the Islanders two nights later. 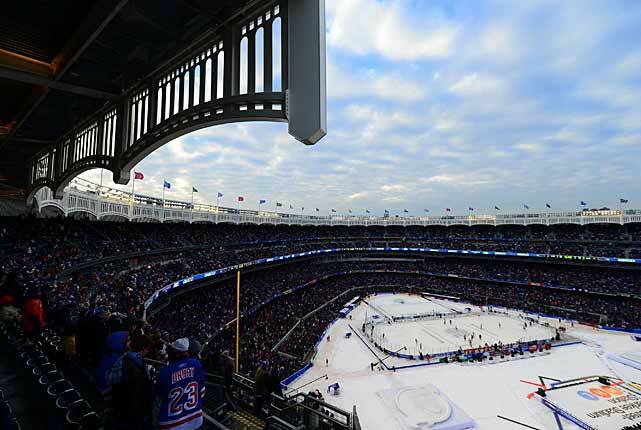 Yankee Stadium wasn't much warmer for its first NHL game on Jan. 26, which featured some sunshine, but the glare delayed the opening face-off by an hour or so. 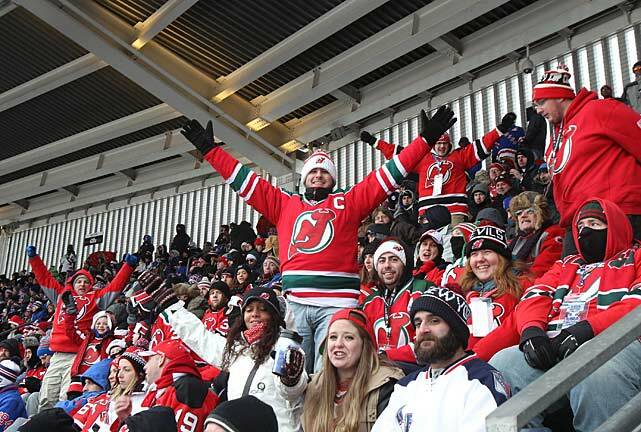 Though the tilt was held in the Rangers' home city, it was technically a Devils home game. A sellout crowd of 50,105 braved temperatures that dropped below 20 degrees with occasional snow flurries. The entertainment lineup had a distinct New Jersey flavor with Southside Johnny and The Asbury Jukes on the bill along with the cast of the Broadway musical "Jersey Boys." Radio City Music Hall's famed Rockettes declined to perform due to the cold. Once the puck was dropped, the Devils rushed out to a quick 3-1 lead. Patrik Elias (with puck) scored twice on Rangers netminder Henrik Lundqvist. It turned out to be an ugly day for Martin Brodeur, who was strafed for six goals on 21 shots as the Rangers roared back for a 7-3 win, doing their part to set an outdoor game scoring record by two teams. The Devils' iconic netminder was pulled for backup Cory Schneider after the second period. 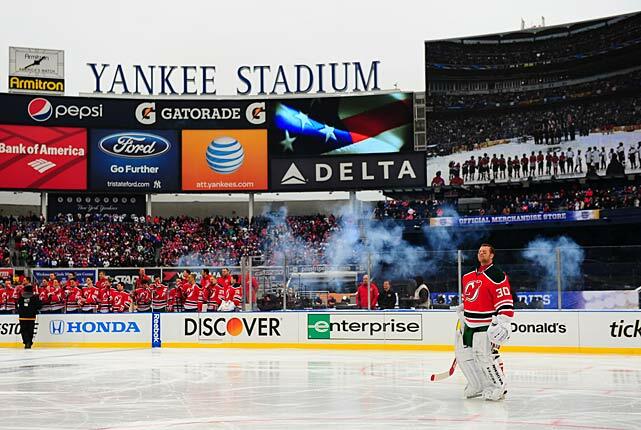 Brodeur later complained that the quality of the ice in the rink was the worst he had ever played on. 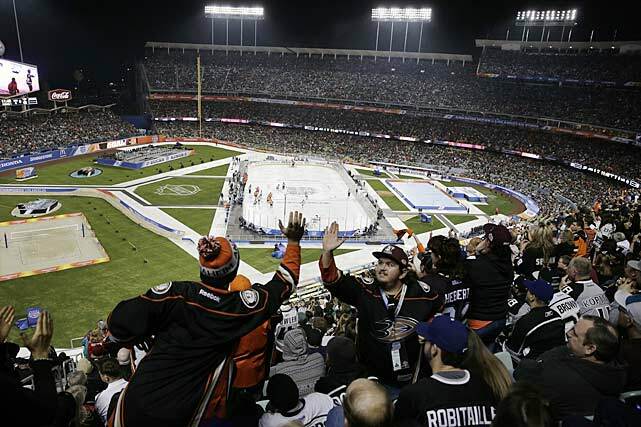 The most exotic locale for an NHL outdoor game to date was surely sunny L.A. and Dodger Stadium, where the Stadium Series opened on January 25 with a game between the Kings and the Anaheim Ducks. Despite climate concerns, this event proved to be a widely hailed success. 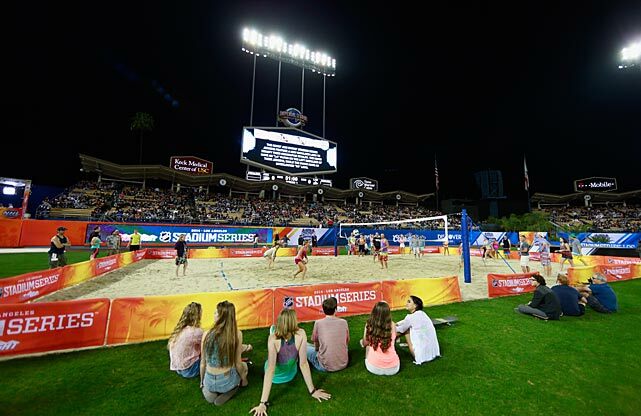 LA's iconic ballpark was transformed into an entertainment palace featuring such distinct California touches as beach volleyball and yoga. What would a game be without a little music? 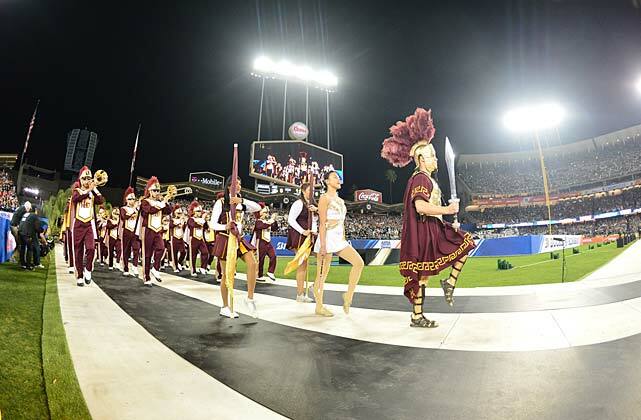 The USC Marching Band was the most unorthodox part of a lineup that included KISS and Five For Fighting. 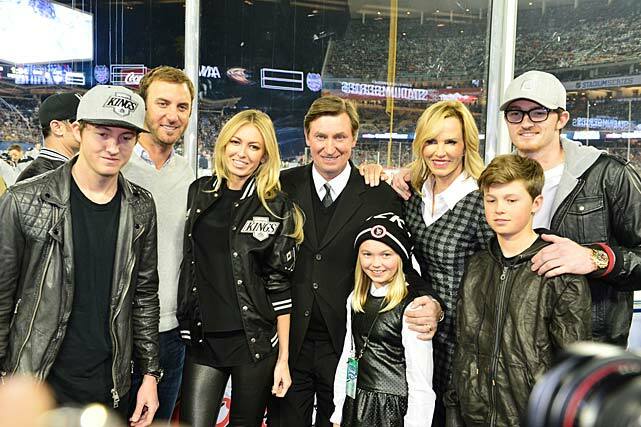 Wayne Gretzky and his family were among the luminaries in attendance. After his landmark trade to the Kings in 1988, the Great One envisioned an outdoor game being played in LA some day. The Dodger Stadium event also marked his public return to the NHL spotlight after a lengthy dispute over pay that he was owed to him from his years as coach of the Phoenix Coyotes. 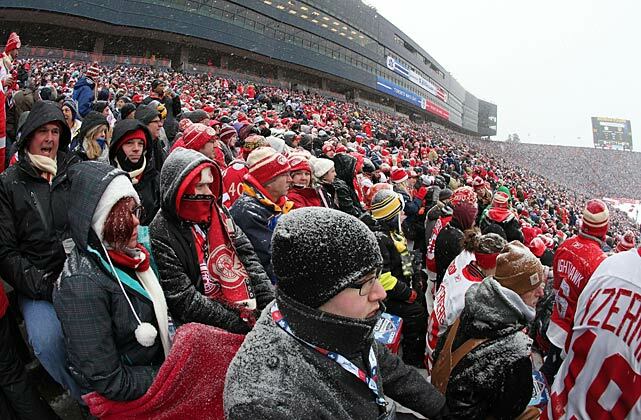 With game time temperatures in the 60s, the 54,099 fans were considerably more comfortable than their counterparts were at the January 1 Winter Classic in Ann Arbor, Mich., where snow fell throughout the day. Despite temperatures in the 60s, the ice was in pretty good shape for the game in which netminder Jonas Hiller stopped 36 shots as his Ducks shut out the Kings, 3-0. 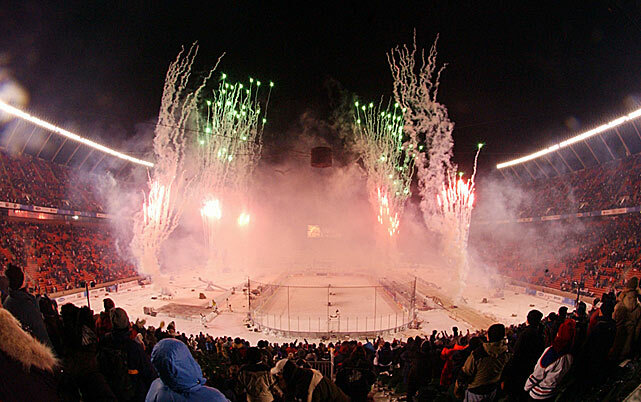 The edition between the Toronto Maple Leafs and Detroit Red Wings on New Year's Day at 109,901-seat Michigan Stadium was the biggest yet. 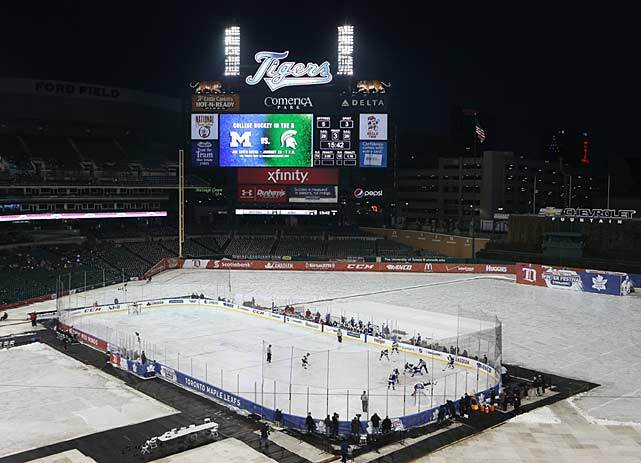 As part of the Michigan edition of the Winter Classic, Detroit's Comerica Park was set up to host a week-long series of Winter Fest events, including college, OHL and AHL games. 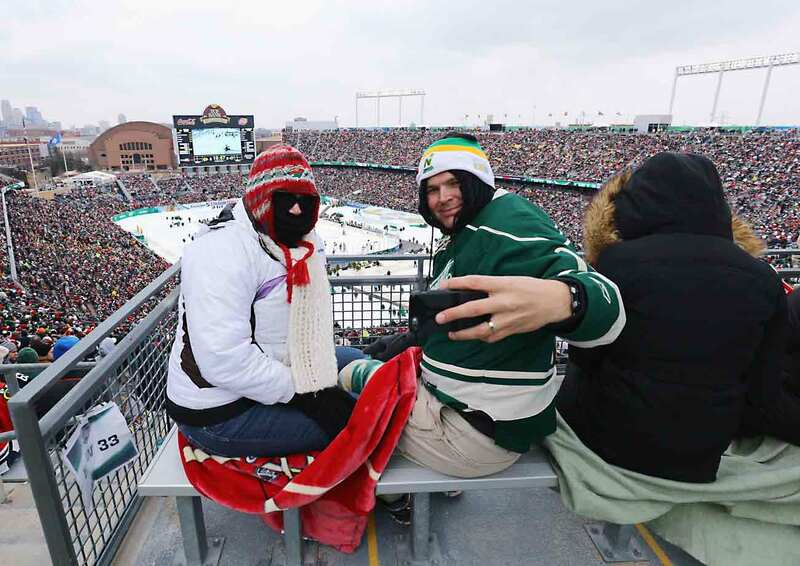 A record crowd of 105,491 battled massive traffic jams to sit in 13-degree weather with a zero degree wind chill. 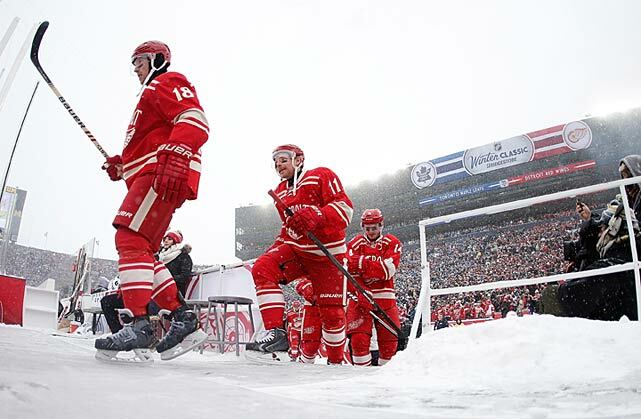 The Red Wings, playing in their second Winter Classic, emerged from their dressing room to a winter wonderland of constantly falling snow. Wind and heavy snow made skating and stickhandling difficult. Goals came at a premium, but it was an entertaining match won by the Maple Leafs, 3-2, in a shootout. 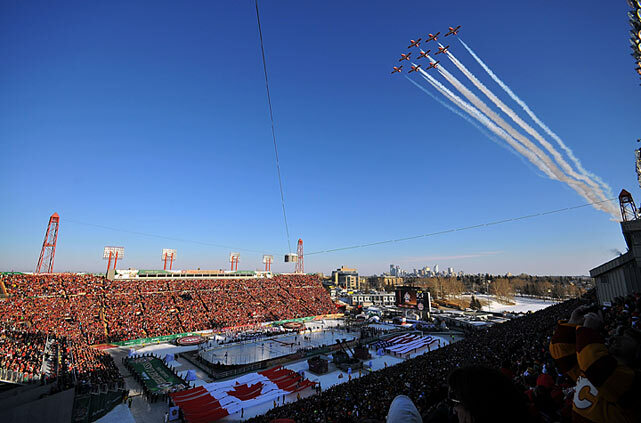 Commonwealth Stadium in Edmonton hosted the NHL's first-ever outdoor game, with 57,167 hardy souls braving -20 degree temperatures on November 22. The event was intended to be a one-off. Where's Taylor? 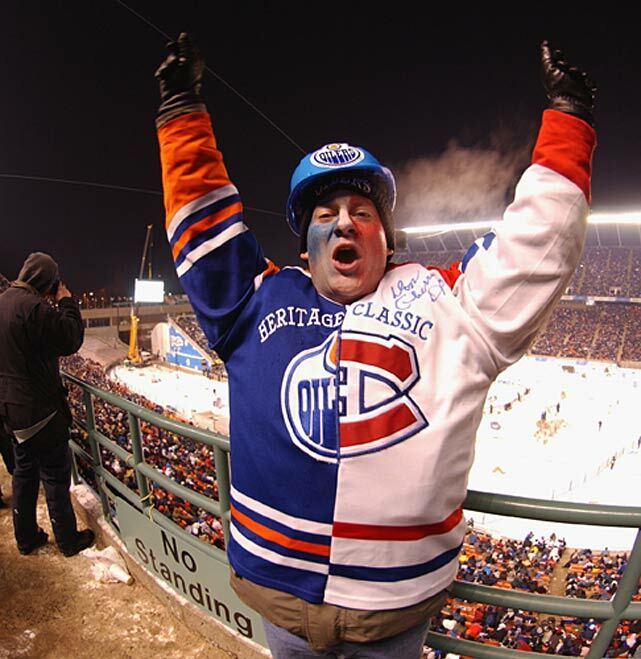 Current Oilers forward Taylor Hall was 12 years old when he attended the game with his dad. They traveled to the event from their home in Calgary. 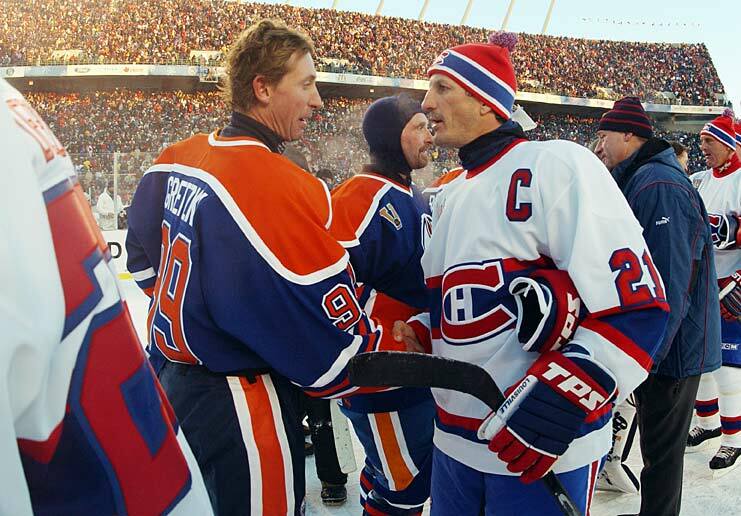 Wayne Gretzky and Guy Carbonneau were among the Oilers and Canadiens greats who skated in an alumni game. The Great One's squad won, 2-0. Gretzky called the experience "memorable" and Habs Hall of Famer Guy LaFleur told the CBC, "It felt like we were 10 again, but with the legs of 50-year-olds." 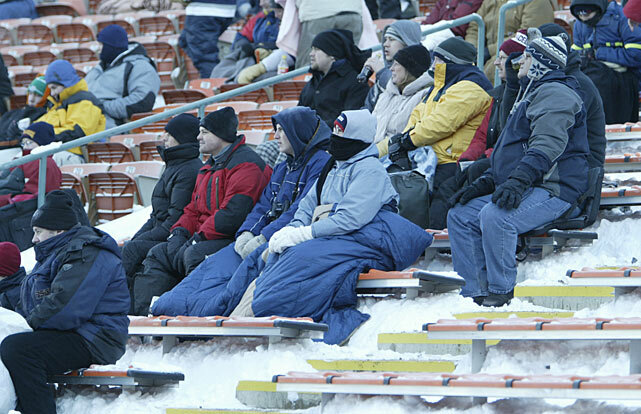 Just chillin' in the stands: As if it wasn't cold enough, the wind chill made it feel like it was -28. In the main game, the Canadiens prevailed over the Oilers, 4-3. Habs forward Richard Zednik (not pictured, that's Patrice Brisebois taking a tumble courtesy of Ryan Smyth) was credited with scoring the NHL's first open-air goal—39 seconds into the second period. It was the first of his two tallies on the night. 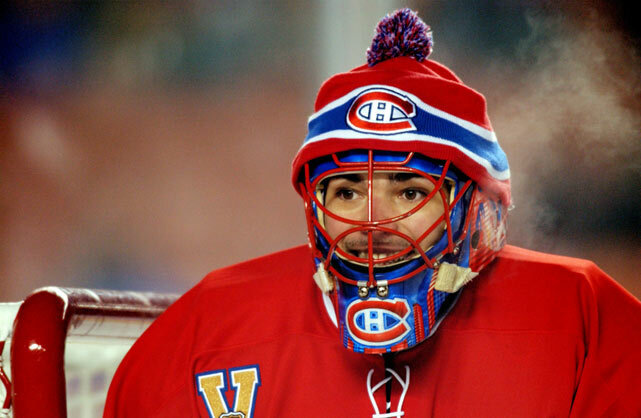 Canadiens goalie Jose Theodore, who made 34 saves in the game, sported a toque in an attempt to stay warm. The evening concluded with a fireworks display, and while the event went over quite well locally, it would be five years before the NHL would venture outdoors again. 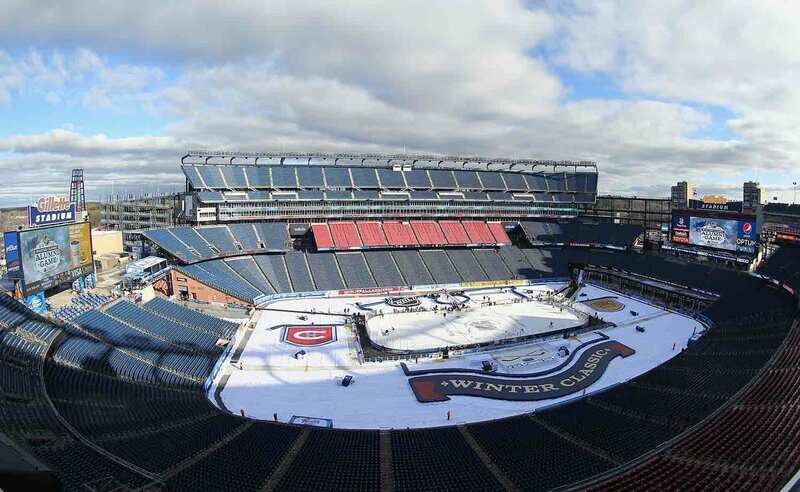 On New Year's Day, the NHL unveiled the first of its annual Winter Classics, billed as a return to the game's roots on frozen ponds. 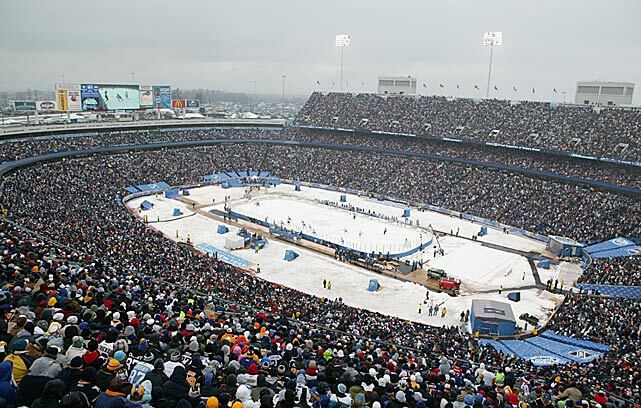 The matchup between the Pittsburgh Penguins and hometown Sabres attracted a league-record crowd of 71,217 to Ralph Wilson Stadium. It was perfect 33-degree weather for hockey as far as Buffalo's passionate fans were concerned. Snow flurries added a nice atmospheric touch, as did the teams' throwback uniforms. 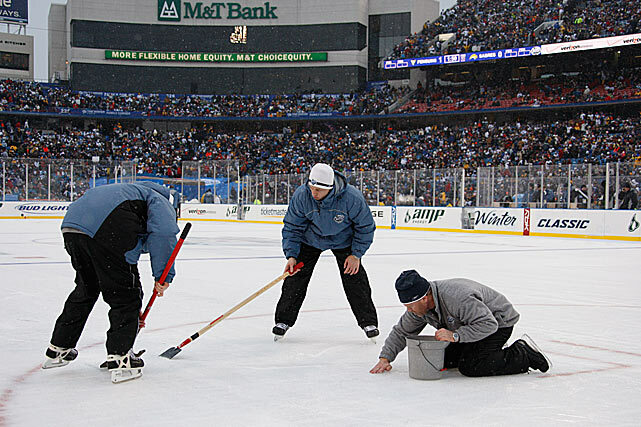 At times, the ice in the specially-constructed rink had to be repaired, which made for some lengthy delays. 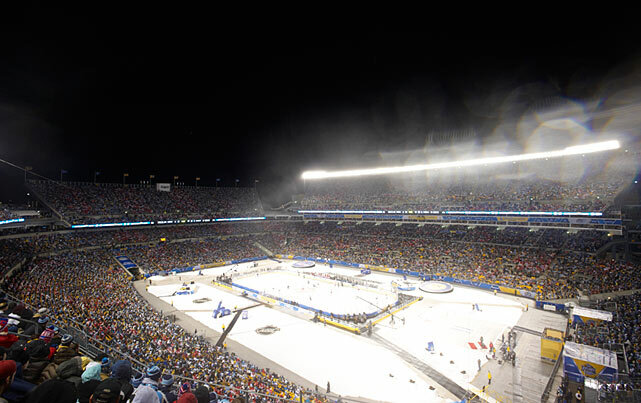 "The only tough part was snow buildup on the ice," said Sabres winger Jason Pominville. "At times there was a lot of snow, and it made it hard for guys to stickhandle and shoot." As he so often does, Sidney Crosby seized the big, nationally-televised stage and scored the game-winning goal by beating netminder Ryan Miller in a shootout. Final score: 2-1. 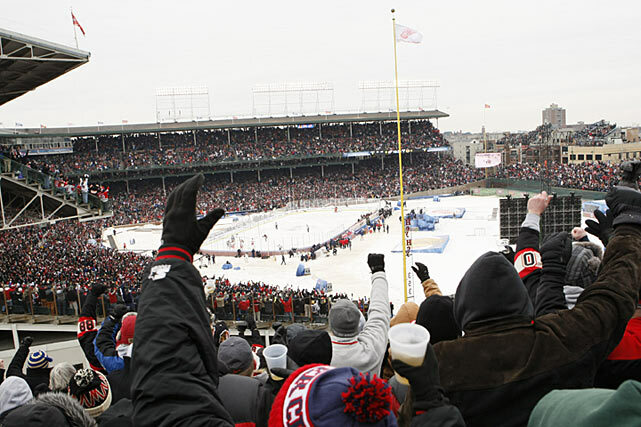 The second edition of the Winter Classic was held in the cozier confines of a baseball stadium: Wrigley Field. The conversion to hockey required 20,000 gallons of water cooled by a huge refrigeration truck that was parked out on Sheffield Ave. 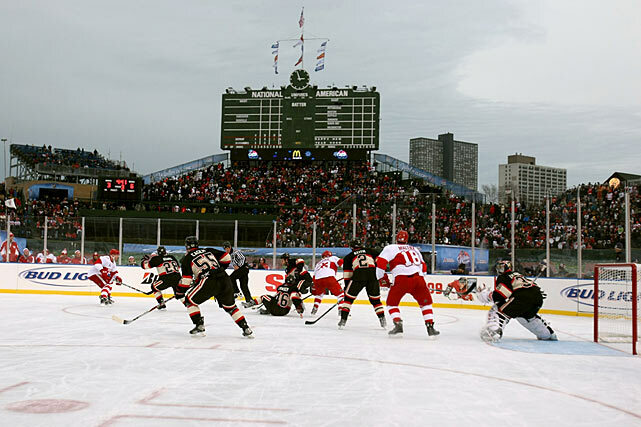 The game between the Detroit Red Wings and the host Blackhawks drew a crowd of 40,818 on a slighly windy, 32-degree day. Fans also jammed the apartment rooftops across the street. Tickets went for as much as $400 apiece. The Blackhawks got Wrigley rocking by taking an early 3-1 lead, but couldn't hold it as the Red Wings roared back with five unanswered goals en route to a 6-4 win. 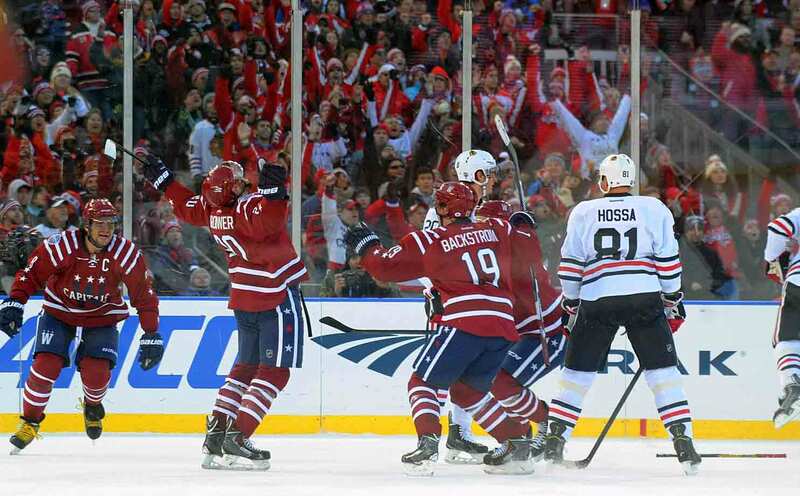 The teams wore throwback uniforms and the atmosphere was festive on a Chicago winter's afternoon. "It was amazing—the whole crowd, the whole atmosphere, it was really unreal," Blackhawks winger Patrick Kane said after the game. "It's like it wasn't really happening. But it was really fun to be a part of." 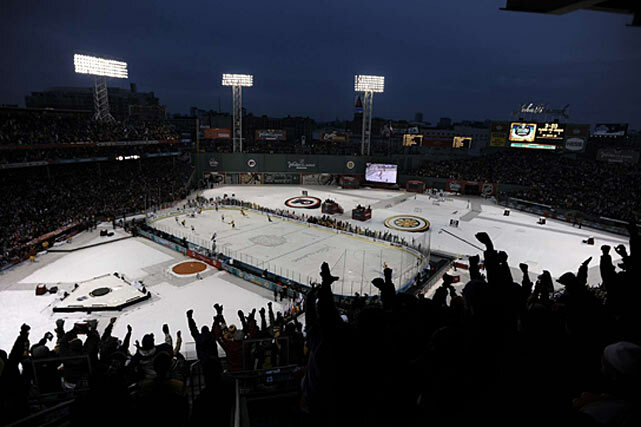 The game's retro feel continued with the next edition played at Fenway Park. 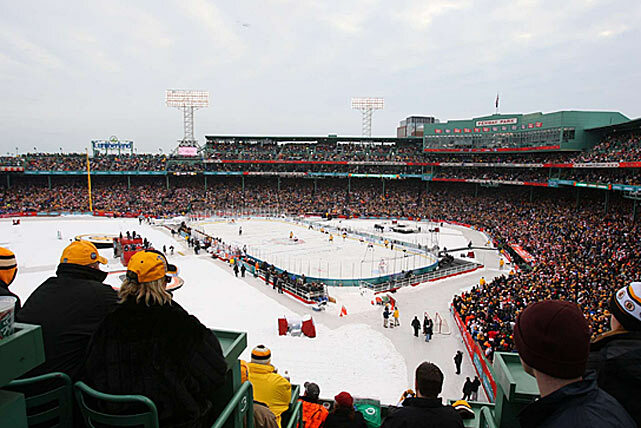 A sellout crowd of 38,112 enjoyed almost balmy 40-degree weather as the Bruins did battle with the visiting Flyers. The snow and rain that were forecast never materialized. Some fans were able to get close to the players. Flyers goalie Brian Boucher spent the game on the bench watching starter Michael Leighton stretch a shutout streak to 154 minutes 7 seconds before he was beaten by Boston's Mark Recchi with 2:18 to go in the third period. The goal tied the game at 1-1. Bruins coach Claude Julien rocked the Toe Blake look by donning a fedora. The crowd went home happy when Marco Sturm scored at 1:57 of overtime to give the Bruins a 2-1 win. 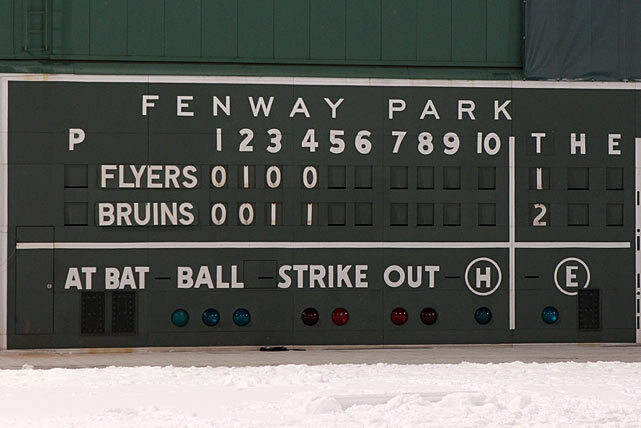 Fenway's ancient scoreboard told the story. Fears about warm, inclement weather came to pass at Heinz Field in Pittsburgh as rain postponed the start of the Capitals-Penguins game from 1 p.m. ET to 8 p.m. 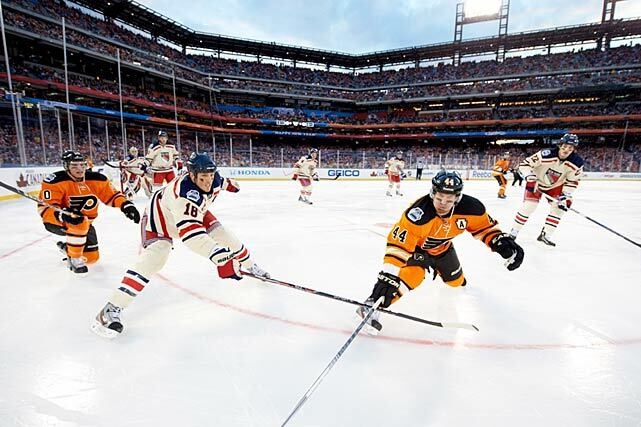 The game offered a marquee matchup of rivals: Washington's Alex Ovechkin and Pittsburgh's Sidney Crosby, who didn't mind the delay in getting started. 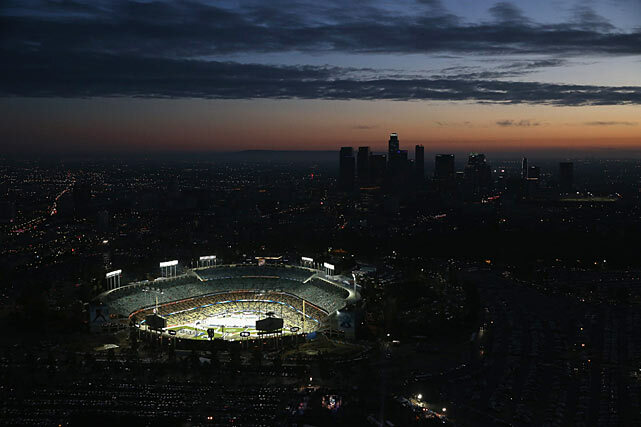 "I don't see anything wrong with playing under the lights here," he said. "I think that'd be pretty nice. We should all be enjoying ourselves no matter what the scenario." The game was a wet, sloppy affair with rain frequently creating puddles on the ice. The home crowd didn't have much to cheer about as the Capitals won, 3-1. Despite the elements, the game drew a crowd of 68,111 and a national TV audience of 4.5 million. 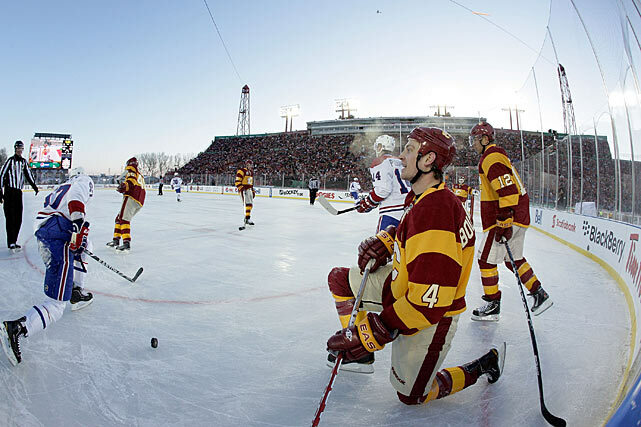 Canada welcomed its second Heritage Classic on February 20, a showdown between the Flames and Canadiens in McMahon Stadium. 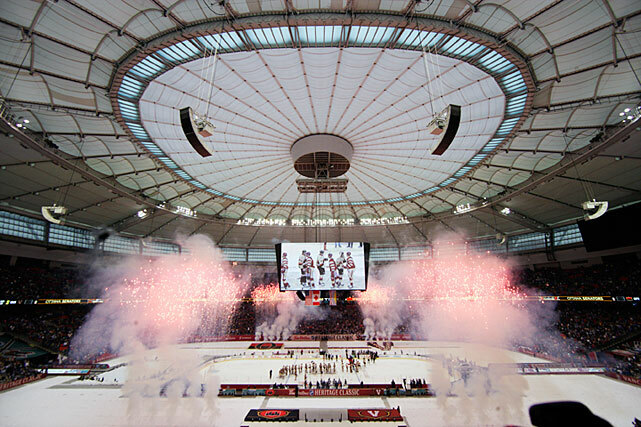 The Flames entered to a heroes' welcome from the crowd of 41,022. 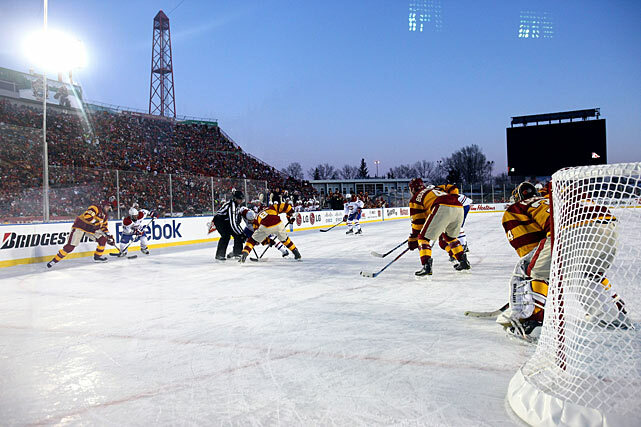 The event also featured an alumni game between members of Calgary's 1989 Stanley Cup championship team and some Montreal notables, as well as AHL and WHL games. Like its predecessor in 2003, this affair was a freezer, with temperatures hovering around -6F. 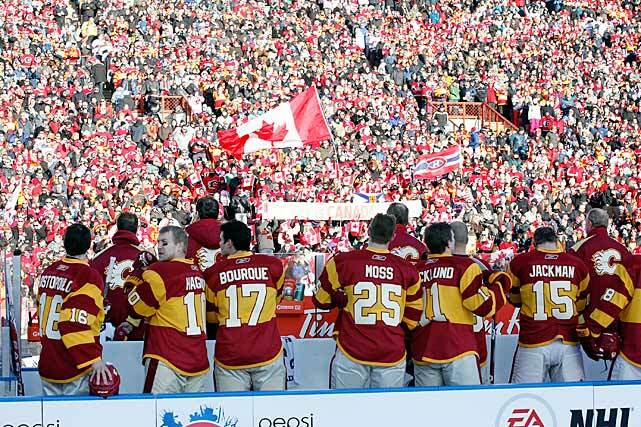 "The stands were full," Flames captain Jarome Iginla said after the game. "I expected some people to go home. I can't imagine how cold they were." Flames goalie Miikka Kiprusoff was sharp, making 21 saves while posting a 4-0 shutout. Ice conditions proved troublesome at times. The rink had to be flooded with a hose due to fears that the weight of the Zamboni would cause the brittle ice to crack and crumble. 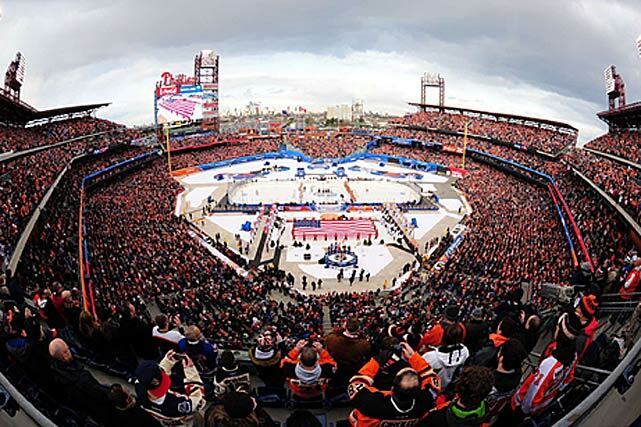 Citizens Bank Park hosted the fifth edition, drawing a boisterous crowd of 46,967 for an Atlantic Division rivalry match between the Flyers and New York Rangers. As happened in Pittsburgh, warm weather delayed the start of the game, this time from 1 p.m. to 3:20 p.m. Game time temperatures were a comfortable 41 with occasional snow flurries. 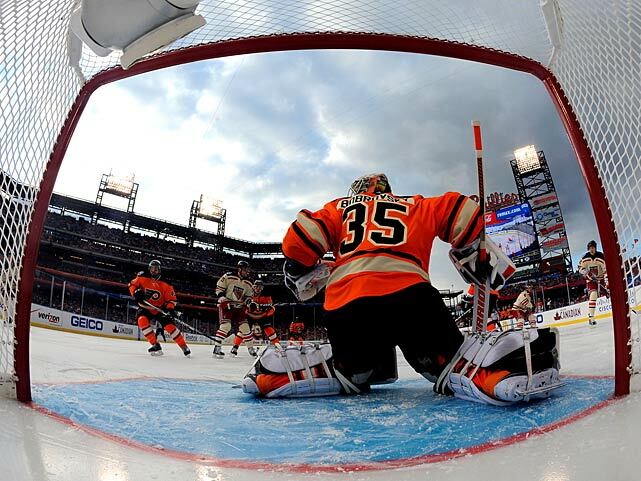 Flyers goalie Sergei Bobrovsky got the start over Ilya Bryzgalov, who became a star for his musings on the universe on HBO's "24/7 Road to the Winter Classic" series. Truth is, both of those hurdles are fairly significant moving forward. There aren’t half a dozen American teams that are capable of drawing the sort of TV numbers the league wants. You’ve got the Red Wings, who drove the two highest rated Classics (2009 and ’14). The Penguins with Sidney Crosby. The Bruins, likely the hosts of next year’s event. Maybe the Sabres, especially if they add Connor McDavid next summer. After that? The NHL and NBC will have to hope for the best. Magical locales? Those are few and far between. Beaver Stadium, home of Penn State football, is an intriguing option. Coors Field in Denver is plenty picturesque. Lambeau Field would be a coup. So would Notre Dame Stadium. 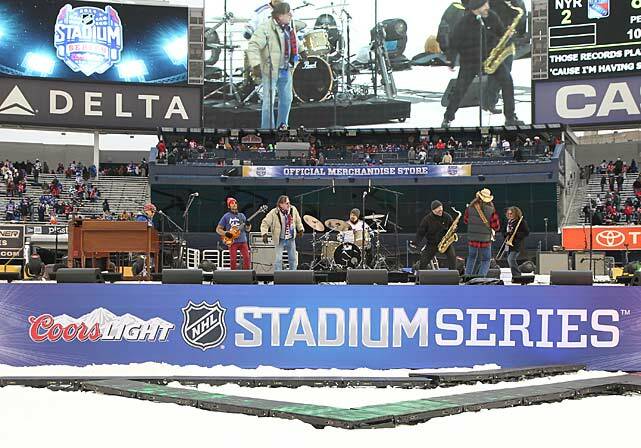 And while a game in Central Park or in a real-life Mystery, Alaska, would be murder on hockey-related revenue, they'd both make for more spectacular TV than what we got on Thursday (though the setup did look great). Of course, that’s just wishful thinking because the whole thing comes down to HRR, doesn’t it? 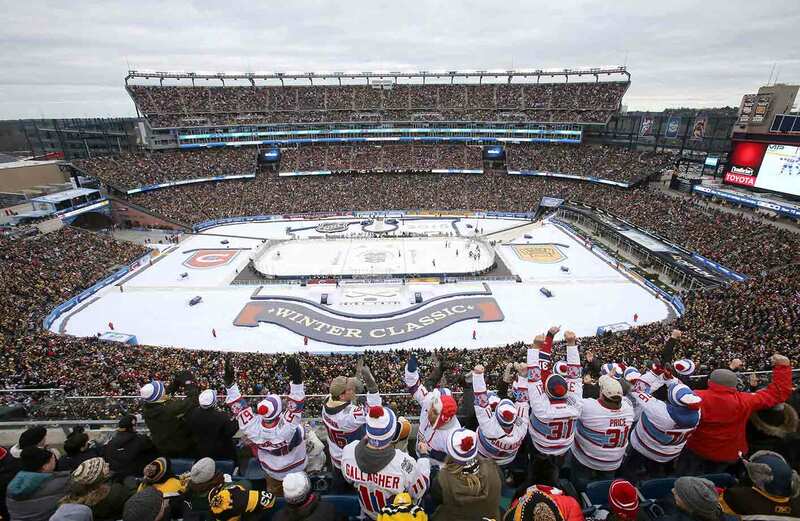 Compared to the typical home game it replaces on the schedule, the Winter Classic is a financial windfall, generating at least five times the standard gate revenue, with special-event pricing and tens of thousands of additional seats. 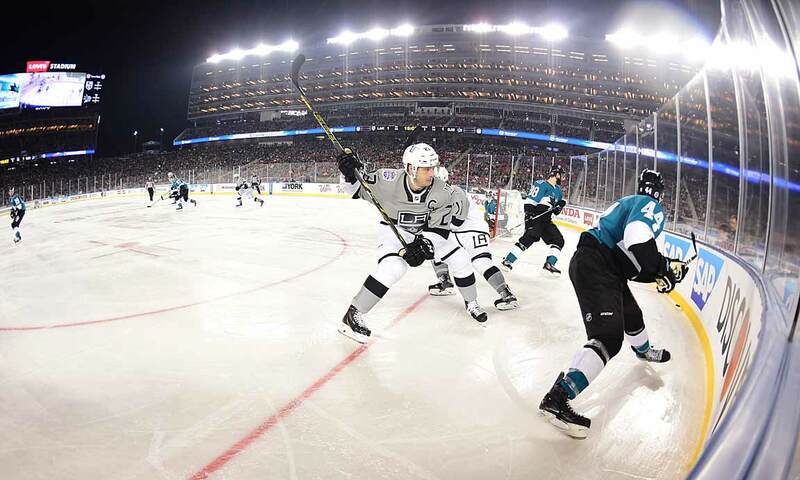 Add millions more from merchandising and sponsorships, and even after you factor in the additional costs that go into staging an outdoor game it’s still a massive win for the league. Make no mistake. Those are the numbers that really matter to the NHL, not a couple of extra points on the Nielsen scale. 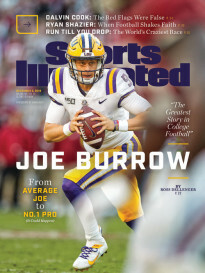 That doesn’t mean that the league won’t look to punch a class above its weight next year. The rumored Boston–Montreal game at Foxboro Stadium, if it comes to pass, makes sense on every level. 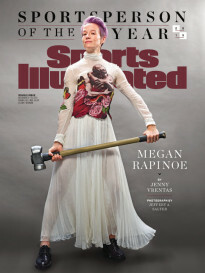 Maybe the league will splurge on between-period entertainment to build some buzz outside the hockey world. Maybe it will climb back into bed with HBO just for the cachet the relationship brings. 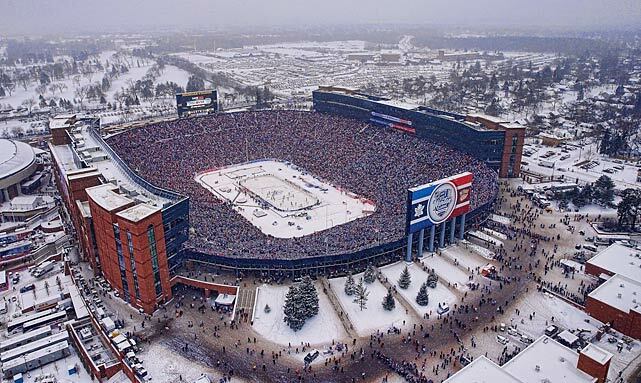 Or maybe the NHL will just accept that the Winter Classic will have its ups and downs, as most annual events do. The league has carved out a nice little TV niche for itself on New Year’s Day, with a bit of room to grow. Given everything else the game brings, maybe that's good enough.